As any dog parent knows, leaving them home alone can be the worst part of your day. Even if you’re just going out to run a few errands, the look on their face as you grab your keys can be heartbreaking. While it’s rough on the owners, it can be even more devastating for the dog to be left on their lonesome. Some dogs don’t seem to have much of a problem with being home alone, but others suffer from a bad case of separation anxiety. If your dog has issues with being by themselves, we’d like to help. 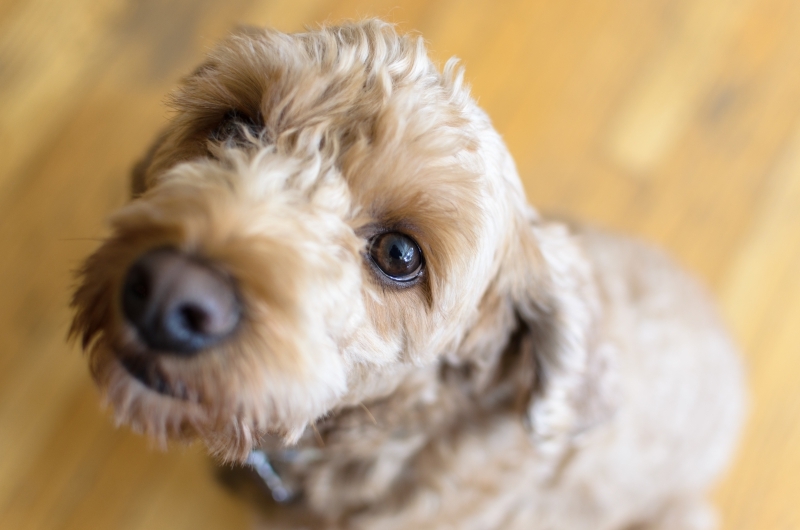 In this post, we’ll provide you with a few tips on helping your dog with their separation anxiety. If you would like more animal care tips or would like to set an appointment at our animal hospital in Tulsa, then don’t hesitate to contact us today! You know your dog better than anyone, so it’s likely that you already know if they have problems with being left alone. 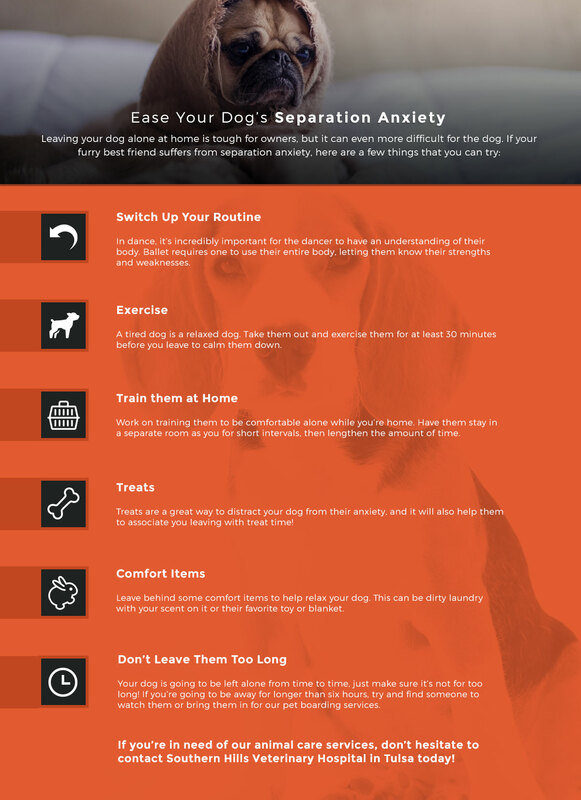 The following are a few tips that you can try to help ease your pup’s anxiety. One helpful trick is to alter your “going away” signals. Your dog gets used to seeing you go and begins to associate certain actions with the fact that you’re leaving. In order to prevent triggering their anxiety. Use a different door, change the location of your keys and shoes, put your coat on but don’t leave immediately. Even minor adjustments will help keep them distracted from your departure. Tired dogs are significantly more relaxed and less prone to anxiety. Try to exercise your dog for at least 30 minutes before you leave. This will help to divert their attention towards sleep or their food, and not the fact that they’re going to be left alone. Another important step to take is to train them to be comfortable alone, even when you are home. Have your furry friend stay in a room by themselves while you are in another area of the house. If your dog has severe anxiety, start by doing this for 5-10 seconds at first, and then slowly work up to half an hour after several weeks of training. Dogs sure do love their treats, and it is also a great way to help them feel comfortable. There are countless treats on the market that will help keep your dog distracted while you are away. One great option is a Kong toy filled with peanut butter. They will be so busy trying to get all of the deliciousness that they won’t even know you’ve left. This is also a great way to help them learn that being alone isn’t the worst thing in the world. Another thing that you can do is hide treats around the house before you leave so that they’ll be distracted trying to find all of the hidden goodies while you’re away. You’re your dog’s entire world, they love you with all of their heart and just want to spend as much time with you as possible. In a perfect world, we’d be able to spend every waking second with them, but unfortunately, that’s just not the case. When you depart your house, be sure to leave something behind that will remind them of you. This can be anything with your scent on it, such as dirty laundry. 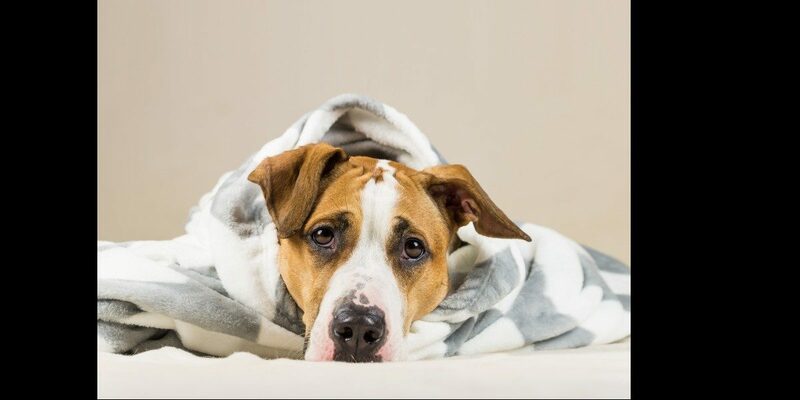 Also leave behind anything that helps them feel comfortable, from their favorite toy to their special blanket. It is also helpful to provide them with some background noise to keep them distracted. You could leave the TV on a low volume, or put on some calming instrumental music. It’s important for your dog to be able to spend time on their own, but there is a limit to that. Make sure that if you’re going to be away for more than 6-8 hours, you find someone to look after them or a place that they can stay. Here at Southern Hills Veterinary Hospital in Tulsa, one of the animal care services that we provide is pet boarding so that you can have the peace of mind knowing that your best friend is being taken care of. If you would like any more tips or are in need of any of our veterinary services, go ahead and contact us today or book your appointment online now!